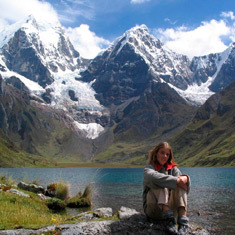 The spectacular Cordillera Huayhuash is located south of the Cordillera Blanca in the Perivian central Andes. Despite being only 30 km long, has become one of the top places for adventurous trekkers. In the opinion of many trekking specialists, this range is the hardest, longest and most spectacular in the world, surpassing the existing routes in Nepal, Himalaya and Africa. It is notabe that the average height during the tour is approximately 4300m. This massive range contains more than 306 peaks of which exceed 6,000 meters altitude. It contains the second highest mountain in Peru, Yerupaja at 6634m altitude. The most direct access to this range is the city of Chiquian (2400m), capital of the province of Bolognesi, which is just off the road to Huaraz. It serves as the primary point of departure and arrival for trekking throughout the Huayhash.